It’s almost spring which means that Easter is coming! Time to break out all the Easter books, right? I needed something slightly different to read this year – not the traditional Easter picture books. 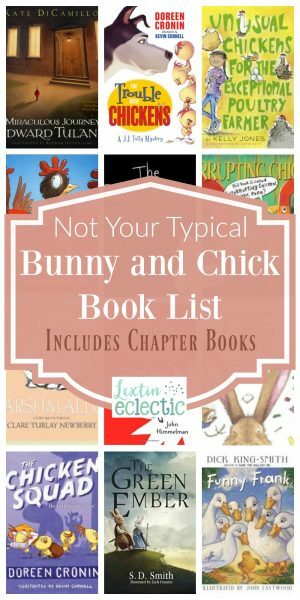 So, I present some bunny and chick books to help usher in springtime. Yes, a few of them are Easter-focused. I just had to include a few of those. But many of them are a little bit quirky, and off-beat. Some are funny. One is about math. Another is about a vampire bunny. That’s something different, right? Discover some new books this spring! And I’ve even included some great chapter book options in case you’re like me and you have some older kids who want more than just the same old picture books. I even listed those chapter books first, so you can grab some book options for your older kids if they need new reading inspiration. It’s a book about rabbits who live on a hill. You would never have guessed that, right? Well, these rabbits are excited because new folks are moving into the new house on the hill. Will the folks be friendly? Will they have a garden? This one is considered a modern classic. You can’t have a reading list without mentioning this very popular rabbit tale about a stuffed bunny who experiences the miracle of becoming real. A much-loved little china rabbit is lost. You can follow his adventures as he journeys to return home to the little girl who loves and misses him. This rabbit is more of a vampire-type bunny. The other animals in the house suspect that there is something very strange about the newest pet – a little bunny. Turns out, they are right! This is an easy illustrated chapter book that is perfect for new readers. It’s all about Isabel, a bunny who specializes in martial arts. Read about the adventures of courageous rabbits who are battling to protect their home from evil tyrants who threaten to take over. Who can forget the iconic rabbit who is always afraid of being late in this literary classic? This one is worth reading for the colorful cast of characters! A former search and rescue dog is brought back into the business to help some little chicks find their missing siblings. This is a mystery filled with lots of fun (and quite a few bad puns). From the author who penned the classic, Babe, comes another animal story. This time the character is Frank a little chick who desperately wants to be a duck. His owners even make him a wetsuit so he can learn to swim. These chickens fight crime and solve mysteries. There is an entire series dedicated to their adventures! A city girl moves to the farm and finds herself with an exceptional chicken – one who can move things with the power of her mind. Soon more unusual chickens join her coop and she must keep their special powers a secret. A young boy is sent to get the turkey for Thanksgiving dinner. He returns instead with a giant 266 pound chicken who terrorizes the entire neighborhood. They agreed to watch the world’s ugliest chicken for a week in return for a trip to an amusement park. But these kids get more than they bargained for as they have to protect the chicken from being abducted. This is a classic that I remember from when I was little. I love that my own kids enjoy the story of a little bunny who wants to run away but finds that he can’t truly escape his mother’s love. Clearly Margaret Wise Brown enjoyed writing about bunnies! Here’s another classic bunny book by the same author. This is a sweet story of a little bunny who tries to find a new home in the spring time. This little bunny wants to be something else – a bear or maybe a pig. Follow his journey to discover who he really is. This is a beautifully illustrated book about a cat who becomes jealous of the newest resident of his home – a little baby bunny. Another classic book – this is an inspiring story about a mother bunny who dreams of becoming the Easter bunny. A little bunny finds a beautiful egg that is just about to hatch. What will hatch from his egg? The illustrations are beautiful in this one! Buddy may have giant ears, but it doesn’t matter, he’s still not able to listen well. Buddy finds himself in a lot of trouble and some funny situations due to his lack of listening. Trixie has a favorite stuffed animal – her Knuffle Bunny. She enjoys an outing with her father until she gets home and realizes that her beloved bunny has been left behind. This is the first in a series of fun books about Knuffle Bunny. We love Kevin Henkes for his mouse books, but he’s also written this playful and fun book about a rambunctious little rabbit. This is a book about rabbits (but it does sneak in a little math and problem solving). It’s a funny and interesting read about lots and lots of rabbits. It’s worth getting for the illustrations and the 3-D elements. So fun! Learn about colors, shapes, and letters with an inquisitive little rabbit and his rabbit friends. This one is perfect for preschoolers! My kids love this series of books about animals that come to the rescue, providing help that is not so helpful. The chickens in this book cause quite a ruckus for the family! Hilarious! Little Chicken can’t keep from interrupting the bedtime stories told by her dad in an effort to warn the characters. In the end, she learns what it’s like to be interrupted in the middle of a story. Four chickens run into the woods to escape a wolf that is approaching their hen house. Running from danger is challenging, especially when they keep imaging the worst case scenario! There are several other books in this fun series! A tiny chicken lays a giant egg and out hatches an enormous creature. The other hens aren’t sure about this new member of their family until this giant chicken saves all of them. On the farm the chickens get tired of their chicken feed so they decide to spice things up with some chips and salsa. They plan a giant fiesta but their delicious food has disappeared. Who has taken it? Henrietta loves to write so she is encouraged to write her first book. However, the reviews aren’t very encouraging. Can she overcome all the negative reviews? A great book for a young aspiring author. This book has such sweet illustrations! A poor little chicken just wants to help, but instead brings disaster to the farmyard all with a pot of blue paint. A gust of wind brings Peggy, an ordinary farm chicken, to the center of a large city. She makes friends and learns to enjoy the city before adventuring back home. Louise gets tired of life in her boring chicken coop, so she travels the world in search of adventure and finds herself in a few tricky predicaments. Rosie the hen goes for a nice walk, unaware that a fox is following close behind. She unwittingly leads him through a hilarious obstacle course in his attempts to catch her. A classic Little Golden Book! This story is about a hen who asks for help in planting her wheat. She receives no help and the other animals learn a valuable lesson by the end. Enjoy the wonderful books in this list as you celebrate spring! If you’d like more reading inspiration check out my list of Easter books and our favorite picture books. For a detailed book list by grade level, sign up for my newsletter in the sidebar. You’ll receive Lextin’s Library, a resource of reading lists for Preschool through 5th grade.